G.B. Burlotto was a winemaker for over 70 years. 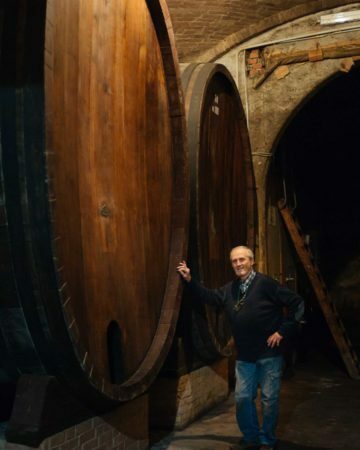 Today, his great-great grandson, Fabio Alessandria continues the legacy of the “Commendatore,” crafting elegant Barolos in Verduno. Fabio greeted us at the gate of his gorgeous cellar and we spent a good 15-20 minutes catching up in his courtyard, which features soaring palm trees. When we asked about how palm trees grow in Piedmont, he explained that his family traced some ancestry to Africa (we’re still puzzled how the trees survive snow). Fabio explained that his great-great grandfather, Commendatore G.B. Burlotto was the first winemaker to sell Barolo in bottles. Historically, it had been shipped in barrels, and Burlotto’s wines have been enjoyed in the UK for over a century. The Burlotto cellars are one of the only wineries we have ever visited whose physical characteristics so perfectly reflect the elegance and finesse of the wines they produce. Historic brick cellars lit by lantern-like fixtures transport visitors back a hundred years, and the tiled halls lined with gorgeous plants and stained glass are the epitome of understated elegance. Guests taste in tastefully appointed salons furnished with antiques and huge plants (Fabio mentioned that his mother loves plants). 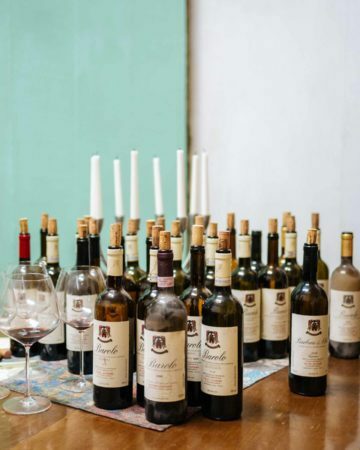 We tasted a selection of Burlotto’s Barolos, in addition to Dolcetto and Barbera. 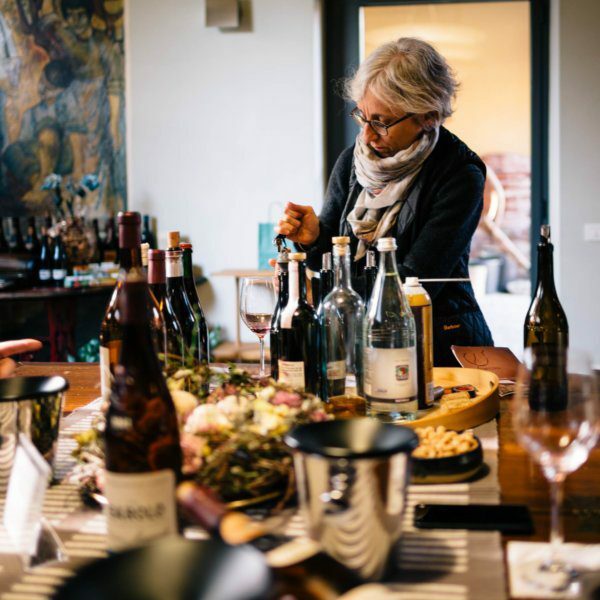 Our good friend Ceri Smith (Food & Wine 2014 Sommelier of the year and owner of Biondivino) commented that one of the most significant features of Burlotto’s wines is that they have a beautiful personality. We wholeheartedly agreed. In writing this, we now sincerely regret not bringing back as many bottles of Burlotto’s flagship Barolo Monvigliero as possible. This special bottling comes from old vines in the Monvigliero cru, and is foot tread (so as not to crush the seeds) before being macerated nearly two months. The resulting wine is profoundly complex and elegant. Ceri noted aromas of black olives, which is one of the wine’s signature traits. Other critics note “exotic incense,” truffle, cedar, “smoky mineral,” Alpine herbs, and leather. If you’re looking for a place to stay, Burlotto also has a beautiful agrotourismo. We’ve had so many requests to craft culinary trips, that we’re now opening a waitlist for 2019. Click here to join the waitlist to travel with the taste and have an experience of a lifetime.